About Provincial Fabric House Provincial Fabric House was instituted by Carlos Rodrigues in 1994. Over the years, Provincial Fabric House has earned recognition for the sale of exquisite upholstery and curtain fabrics globally. 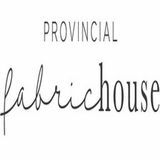 Provincial Fabric House is located in the Southern Highlands of NSW. Our offline warehouse, as well as the online website, provides all esteemed customers with choicest fabric selection from reputed European mills that supply elite designer labels. Exciting holiday sales and free fabric swatches are eye-catching offers, one can avail on our online site. What is Upholstery Fabric? ď&#x201A;´ Upholstery Fabrics has been our expertise and none can resist the beautifully crafted fabrics at the sale in our fabric shop. Vibrant colors, delicate designs, millions of patterns in exotic fabric materials are sure to drive you crazy. You can enjoy a wide collection of upholstery and curtain fabrics in terms of fabric type, fabric color, cost of material, quantity, and patterns. ď&#x201A;´ On our online site, we provide customers with information about different fabrics so that they can select the best for their home furnishing needs. Belgian Linen Premium linen manufactured and processed exclusively in Belgium is what makes Belgian Linen fabric unique. It is a certified product with excellent properties exquisitely fabricated by Belgian craftsmen. It is a high-end upholstery fabric perfectly suited for a house with a formal look. Belgian linen stands for high quality, comfort, and durability that will last a lifetime. Hemp Hemp fabric is obtained from the eco-friendly Hemp plant. It is a trending upholstery fabric with high sustainability. Hemp is harvested with no pesticides, less irrigation, no chemical processing, and the end product being biodegradable, it is the premium product for all environment lovers. It is a highly durable fabric that has antimicrobial and UV rays resistance features. Silk Silk Fabric is derived from the cocoons of silkworms, this special luxe material is the ultimate upholstery fabric suited for a festive season. Shimmering varieties of silk in deep rich colors are always in demand at Fabric House. Mulberry silk is the most popular among all silks. Silk is a delicate fabric so it should be used with care to preserve its life. It tends to warp in sunlight.